Successful production of high quality and specialty peaches in western North Carolina represents a profitable opportunity for growers wanting to diversify farm income. New cultivars developed at NC State University have the potential to overcome the region’s typical problems with freeze/frost damage to peaches. These high-chilling cultivars are being tested in addition to cultivars with other characteristics that are desirable to consumers, such as low acidity and unique shape and flesh color. 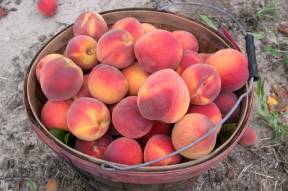 In 2001, 15 cultivars of peaches were planted at the Mountain Horticultural Crops Research Station in Fletcher, NC. These were primarily NC released cultivars of both white and yellow-fleshed varieties. Seven additional selections were planted in 2002 with superior traits such as cold hardiness, white flesh, low acidity, late ripening, or doughnut shape (“peento” type). There are no results to report at this time regarding the cropping potential of the named cultivars or selections. In 2003, the trees that were planted in 2001 will be allowed to crop. Tree growth and survival has been exceptional and the flower bud set for 2003 looks very promising. No conclusions can be made at this time due to the time required to get peach trees into production. However, we believe that peaches provide a profitable opportunity for small and/or diversified farmers in western NC. 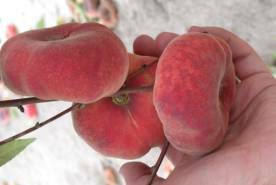 There are several workshops and educational programs scheduled for early 2003 in western NC in addition to a potential fruit tour at the Mountain Horticultural Crops Research Station in the summer of 2003. • It's Time Again for That Juicy Goodness!